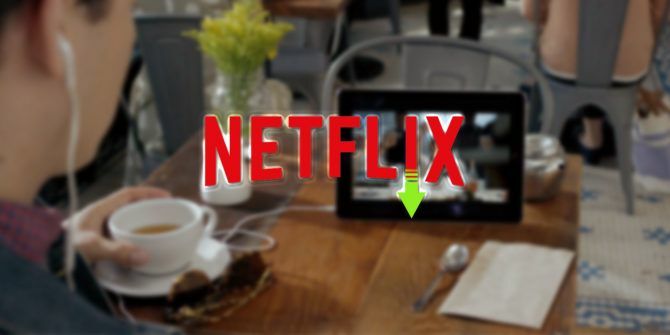 Netflix introduced You Can Now Download Netflix Shows to Watch Offline You Can Now Download Netflix Shows to Watch Offline Netflix is now allowing users to download content from its catalog to watch offline. This means you can enjoy Netflix even when you can't find a decent internet connection! Read More offline viewing for its users a while back, but until now, it remains a feature available only in its mobile and tablet apps, and you can’t download just any show or movie. If you watch Netflix on your TV or in a browser, this method won’t work for you. Fire up Netflix on one of the platforms listed above. Tap the hamburger menu button and go to Available for Download. If you choose to download a TV show, you’ll see a download button next to each episode. If you choose to download a movie or documentary, you’ll see a download button under the red Play button. Once you tap the download button, you can see the download progress at the bottom of the screen. To view your downloads, tap the hamburger menu button and tap My downloads. To delete a download, go to My Downloads, tap the episode or film you want to delete. When it opens, tap Edit, and then tap the red X button. You should also bear in mind that some downloads will expire after a certain amount of time. Some downloads expire 48 hours after you first start watching them. Other downloads may expire before you watch them, but the app will start letting you know once you have less than seven days to watch it. And of course, anything you download will take up bandwidth when downloading, and will take up storage on your device. Do you use Netflix’s download feature? Are there shows that aren’t available to download that you wish you could take on the go with you? Let us know in the comments. The 10 Best Racing Games for AndroidHow Do I Update Kodi?